"I disagree with Bobby. I think probably the most competitive rookie class at the Speedway was 1982." – Chip Ganassi, who along with Rahal was a rookie in ’82. Yes this is indeed quite the rookie class, and as you can see from this embarrassing yet amusing photo from TrackSide Online the good folks at The Brickyard are going to milk this cow ‘till she drops. 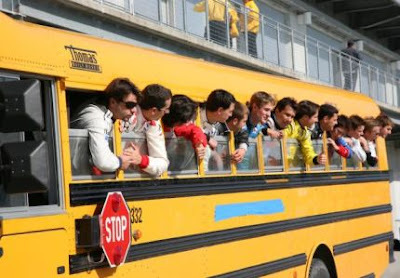 And what they feel like doing some pedal-mashing at Indy, as all IMS rookies not named “Mario” (Moraes and Dominguez) have now completed the ambiguously titled “Rookie Orientation Program”. Not only have they passed the various tests, but as a testament to the crazy mad driving skillz of this year’s class they’ve all done so without any major incidents. Well, all except for Jamie Camara, who will be re-evaluated after backing into Turn Four at full speed yesterday. God bless the SAFER barrier. Now you may inquire, “What exactly is this ‘Rookie Orientation Program’”? Funny you should ask, because the good folks at The Starting Grid have pulled back the veil of secrecy to reveal the awful truth of each of the four gruesome tests put forth to the freshmen. Test 1 (Test of Loyalty): Each driver is placed in a tiny room with no lighting. A series of questions are directed at the driver via a loud speaker. At some point in time, Gene Simmons will enter the room. Drivers tell us that everything gets hazy at this point, so no one is quite sure what happens. Test 2 (Test of Strength and Speed): Each driver is forced to push AJ Foyt and his golf cart up a large hill. Upon arrival at the top, AJ will grab a wrench in a whiskey induced rage and chase the driver back down the hill. Test 3: (Test of Courage): Each driver must stand several feet from Marty Roth's pit stall while blindfolded. Any movement or soiling of oneself results in a failing grade. Test 4: (The Final Test): This test is make it or break it for many of the rookies. Each rookie must complete 20 laps at full speed while blind folded. They can rely only on the instructions of their spotter, which is none other than Milka Duno. Here are the best times for each driver so far. Just for reference, Helio Castroneves claimed the Pole Position last year with a speed of 225.817 mph. I can tell you Test 1 is utter crap. I know for a FACT Gene Simmons would never do anything that a) had to be kept secret b) couldn't be televised and c) he couldn't get paid for.